Appeon PowerServer works with standard n-tier architecture. Each tier serves a specific purpose in the architecture, though it may not necessarily reside in the same physical machine. 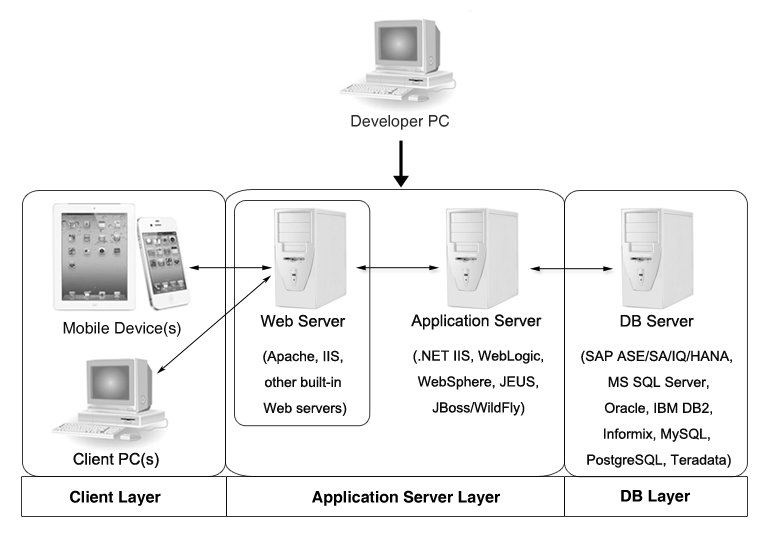 For example, the Web server, application server and database server can reside in one machine or in different machines. A single tier may also be spread across multiple physical machines. For example, the application server can consist of a cluster of PowerServer computers to provide load balancing and failover. Appeon applications deploy to the standard n-tier architecture - the client tier, middle tier (application server), and data tier (database) are logically separated. Each tier should have appropriate Appeon components and/or third-party software installed according to its role within the architecture. The following table briefly lists the tiers, roles, their purposes and the required Appeon/third-party software. Runs the Appeon native mobile applications. Runs the Appeon Web applications in Web browsers. Deploys your PowerBuilder application to the server. Responds incoming requests from the client tier, and dispatches requests to the application server. Hosts the presentation layer of the deployed Web applications. Hosts the DataWindows of the Appeon deployed applications, and provides the necessary run-time services to the deployed applications, such as DataWindow retrieval and update, Embedded SQLs, dynamic SQLs, security authentication etc. Appeon application middle-tier can invoke Java components, external DLL functions, and C++ components. Furthermore, it supports Web Services for the most flexibility integrating with J2EE and .NET. JDBC-compliant RDBMS supported by Appeon. Please see Database server requirements for more information. The middle tier, which hosts the business logic, is implemented with J2EE or .NET components. These components execute the DataWindows, Embedded SQLs, and dynamic SQLs of the deployed application. The middle tier deploys to the Java or .NET compliant PowerServer, leveraging dozens of many-years of investments in DataWindows and other business logic. The database stores the raw data for the application and stored procedures, if any. The existing database from the PowerBuilder application can be simply re-used without modification so long as it is an Appeon-certified database.